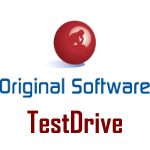 TestDrive integrates with all the other elements of solution suite so that tests can be run from within Qualify, scripts can be built automatically from manual test results within TestDrive-Assist, and effects in the database can be simultaneously verified in TestBench. Support for AJAX, .NET, Oracle, Java, JSP's Perl, Python, PHP etc. It captures, analyses and compares all of the objects, grids, controls and components of the application. TestDrive is a full-featured automated testing solution designed to test GUI and browser applications "out-of-the-box".